We don’t usually notice how our eyes feel until something is wrong with them. Having dry eyes is the sensation of something being stuck in the eye or a gritty, scratchy, stingy, or uncomfortable feeling; In some cases there can be eye redness, light sensitivity, blurry vision, or eye fatigue. Episodes of these feelings can be interspersed with excessive tearing as the eye tries to compensate for the dryness. If left untreated, chronic dry eyes can damage the eye tissues and cause vision problems (1). Typically, the eyes to stay moist and comfortable by producing a steady stream of basal tears to lubricate the cells and protect them from the environment. Dry eyes occur when this tear production decreases, tear evaporation increases, or tear composition is imbalanced (2). What are the most common causes of dry eyes? Having an optometrist or eye care professional examine your eyes is usually the first step to treatment. They will perform a comprehensive eye exam and potentially other tests to measure the volume and quality of your tears. The most common treatment is over-the-counter eye drops that act as artificial tears to lubricate the eyes and reduce discomfort. Other treatments such as anti-inflammatories, tear stimulating drugs, and surgery are considered on a case by case basis depending on the severity and persistence of symptoms. If the dry eyes are being caused by a medication or other underlying medical condition, a doctor can adjust medications or will refer their patient to the most appropriate specialist. Lastly, environmental and lifestyle changes are suggested to reduce stress on the eyes: limit screen time or take frequent breaks to close your eyes or blink several times, and avoid exposure to dry, windy, or smoky environments. How can Traditional Chinese Medicine and Acupuncture treat dry eyes? In Traditional Chinese Medicine, we know health and lubrication of the eyes is made possible by the internal health of other organs. Dry eyes are often a sign of an internal imbalance that causes dryness in other areas of the body (i.e. for some dry eye patients we focus on improving the function of the Large Intestine, which then helps moisten the eyes). Traditional Chinese Medicine will adjust these internal imbalances to help the body process moisture, reduce dryness, and benefit the eyes. A 2015 study reviewed research involving acupuncture for dry eyes and concluded that “acupuncture therapy is effective for the dry eye patients, partly better than artificial tear treatment” (4), while another from 2016 concluded that acupuncture improved ocular symptoms, increased the amount of tear secretion, and extended the break-up time of tear film more than the drugs used in control groups (5). 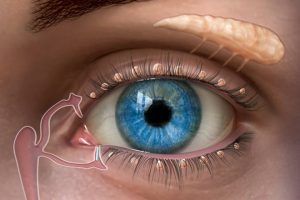 Another study compared acupuncture to eye drops for the treatment of dry eyes, which also showed positive results for the treatment of dry eyes with acupuncture. A group of 150 patients with dry eyes were divided into two groups: one that received four weeks of acupuncture treatment and another that received artificial tear treatment. Immediately after treatment, both groups had improved and noticed less dry eye. However, eight weeks after the treatments, the group that used the eye drops had their dry eye symptoms return. Whereas the group that used acupuncture did not have their symptoms return and noticed less dry eye (6). How can Acupuncture help treat dry eyes? An acupuncture treatment for dry eyes will address both the dry eyes symptom, as well as any internal imbalance that is contributing to the condition. Through the acupuncture, we are able to stimulate the glands surrounding the eye both directly and indirectly, to increase the oil production (which keeps the eye moistened). Surprising to most, most of the acupuncture points used are actually in the ears and hands. No needles go into the eye. Find out more about how we treat eye conditions, as well as other conditions we treat. If you or a loved one are dealing with the discomfort of dry eyes, please do not hesitate to contact us to find out if/how Acupuncture and Traditional Chinese Medicine can benefit you.